Take that plain boring tee-shirt and let’s revamp it for the summer! 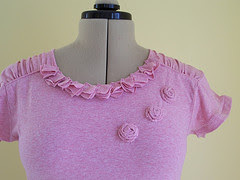 Learn how to use cut-off sleeves to create coordinating accents like flowers and more! We'll cut, add, and embellish using our own handmade appliqués and embroidery. I'm returning back to Craftland to teach easy, functional, and eco-friendly sewing classes. You can go to the Craftland site and sign up for my tee-shirt class and any of the other great classes they're offering.